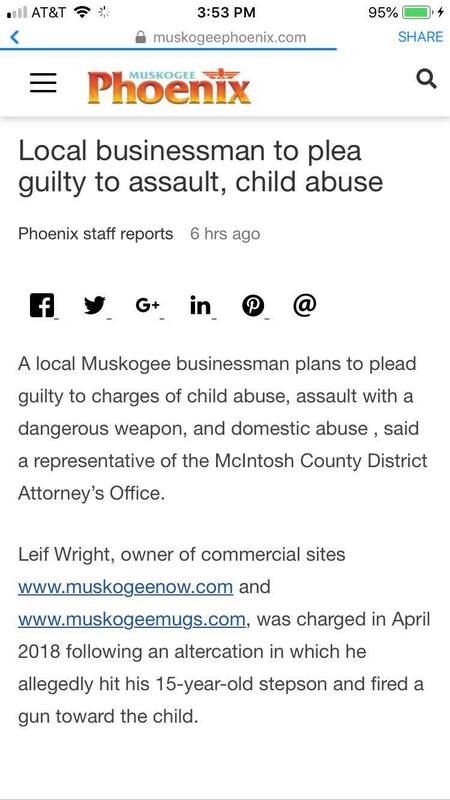 The Muskogee Phoenix newspaper today published a lie about MuskogeeNOW.com owner Leif M. Wright (me), in part stating that I planned to plead guilty to several charges against me. In their grammatically incorrect headline (the word “plea” should be “plead”), the newspaper claimed that I was going to plead guilty to assault and child abuse. The story went on to say that my attorney, Steve Money, declined comment. Money said he never spoke to anyone from the Phoenix. “Someone called and they were told I would call back and I totally forgot about it and didn’t call them back,” he said. I personally called Elizabeth Ridenour, the new executive editor of the newspaper, and said they’d be needing to print a retraction since I have never planned nor do I now plan to plead guilty to charges of child abuse, assault with a dangerous weapon and domestic abuse. Further, I told her, my attorney did not speak to the paper. As a top editor at that newspaper for 20 years, I was in charge of training newspaper staff like Ridenour to avoid this kind of libelous reporting when she was hired. To set the record straight: I have never planned, nor do I now plan, to plead guilty to any of the charges against me.